The Steve Lopez column appearing in today’s Sunday Los Angeles Times highlighted the story of a local math teacher that should be awarded a prize for “Most Dedicated.” I feel a warm feeling each time I read it. 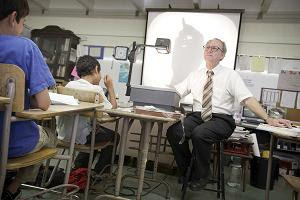 The article “Retired Los Angeles teacher keeps at it, for free” is about Palms Middle School math teacher Bruce Kravets who is in retirement, but still teaches his seventh grade algebra class for no compensation. At 66, Kravets accrued a comfortable level of retirement income after 44 years of teaching, but he chose to stay on at the school because he loves teaching so much. That’s dedication! I’m confident that a young person learning mathematics from a teacher who loves teaching for the sake of learning is going to take away much of value. Of course, a teacher can be dedicated without forsaking his/her salary, but someone like Kravets sets a pretty high standard for quality education. Knowing how much we need our young people to embrace math and science these days, I’m very encouraged by the results of his efforts. I very much applaud Mr. Kravets.